NASA images and caption information courtesy William Putman, NASA Global Modeling and Assimilation Office. Caption by Holli Riebeek. Science is a process. A scientist makes observations, poses a hypothesis to explain the observations, and then systematically tests the hypothesis, looking for evidence that either supports or refutes its validity. Many of us think of scientists experimenting in a lab during the hypothesis-testing phase, but for scientists studying how the Earth works, their lab is the planet. It’s difficult to systematically tweak temperatures here or clouds there to see how the system works. Instead, Earth system scientists combine observations of the real world with complex computer models. The models allow scientists to test different scenarios, while the observations provide a reality check. Both are necessary in understanding how and why Earth’s atmosphere, land, and oceans function together as they do. These images compare a simulation from a detailed global atmospheric model, top image, with observations from the GOES satellite from the same time, lower image. The model is called the Goddard Earth Observing System Model, Version 5 (GEOS-5), and the image shows a moment in a five-kilometer run, one of the highest-resolution runs of the model to date. GEOS is an atmospheric model used to study the physics of the atmosphere in both the short term, weather, and mid to long term, climate. Comparing the results for a single day to a satellite image reveals how well the model works in a short-term run. The model image represents a single point in time 90 hours into a 20-day model run that started on February 2. 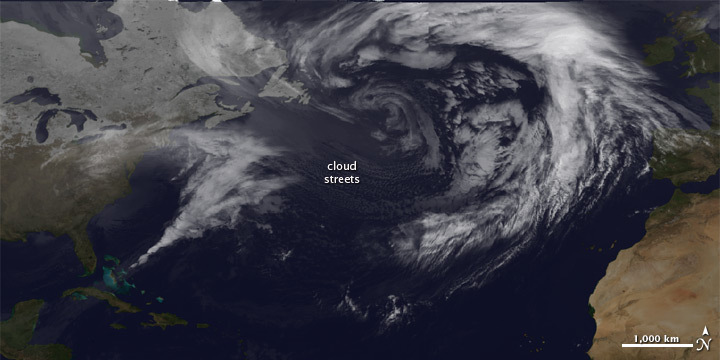 The lower image, taken by the NASA-NOAA GOES satellite, shows how well the model predicted cloud features for February 6, 2010, the day a massive winter storm dumped several feet of snow on the Washington, DC region. Both the model and the satellite sensor use infrared energy to measure clouds. These images show cloud cover (as measured in infrared energy) on top of a static true-color image of the land. The model matches the satellite image quite well. 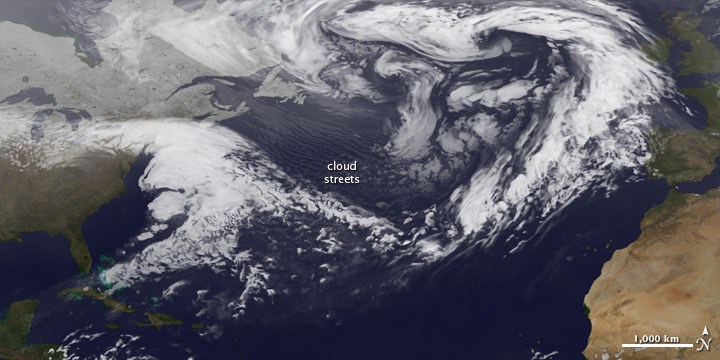 The model accurately predicted the location and shape of major cloud systems, both the long curved band of clouds over the eastern North Atlantic Ocean and the large winter storm off the coast of the United States. The model’s high resolution also allowed it to forecast very specific cloud features. It predicted lines of small clouds, clouds streets, east of the winter storm. As the satellite image shows, the tiny clouds formed as predicted. The large images, which include the entire globe, show that the model also accurately predicted clusters of thunderstorms in the tropics. The GEOS-5 model normally runs at a resolution of about 28 kilometers per pixel to study the connections between weather and climate. It can run globally at 3.5 kilometers, making it one of the most detailed global atmospheric models in the world. The model run shown here has a resolution of 5 kilometers. The typical climate model simulates clouds at about 100 kilometers per pixel. A flat map of the globe produced by a 28-kilometer climate model contains 777,000 grid cells (pixels). The five-kilometer GEOS map, like the one shown here, contains 24 million grid cells. This means that scientists can get substantially more detailed information from the model. The GEOS-5 model, like all weather and climate models, uses mathematical equations that represent physical processes (like precipitation and cloud processes) to calculate what the atmosphere will do. Actual measurements of physical properties, like temperature, moisture, and winds, are routinely folded into the model to keep the simulation as close to the real world as possible. The millions of calculations involved in creating such a detailed global model require thousands of computer processors. The GEOS-5 model runs on the Discover supercomputer in the new NASA Center for Climate Simulation at Goddard Space Flight Center. Discover contains nearly 15,000 processors and will soon be augmented. NASA climate scientists use GEOS-5 to predict climate over the span of a few decades. The GISS ModelE is a long-term climate model also running on Discover. ModelE is currently being used to simulate climate between about 1000 AD and 2100 AD. The largest project running on the supercomputer is the Modern Era Retrospective-analysis for Research and Applications (MERRA), in which GEOS-5 integrates more than 50 billion observations, mostly from Earth Observing satellites, into a single model simulation of climate from 1979 to the present. The NASA Center for Climate Simulation began operating under its new name on June 2, 2010. To learn more, see Supercomputing the Climate, a short video about the supercomputer and the climate models that run on it. Cohen, J. (2010, June 2). NASA Center for Climate Simulations: Data supporting science. NASA. Accessed June 8, 2010. NASA Scientific Visualization Studio. (2010, June 2). Supercomputing the Climate. NASA. Accessed June 8, 2010.